Hello, Friends! It's Monday...we've got a shiny new week ahead of us! I hope you're enjoying the 5 Days of Digis! Well, let's keep this party going, shall we? 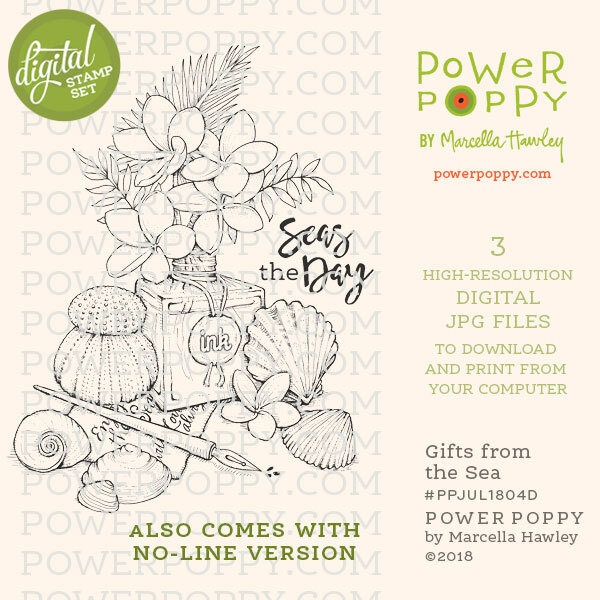 Today's digi is one of my favorites, it's called Gifts From the Sea and it's a beauty! "First of all, I'm going to recommend that everyone stop, run to the library, and pick up a copy of Anne Morrow Lindbergh's book, Gifts from the Sea. 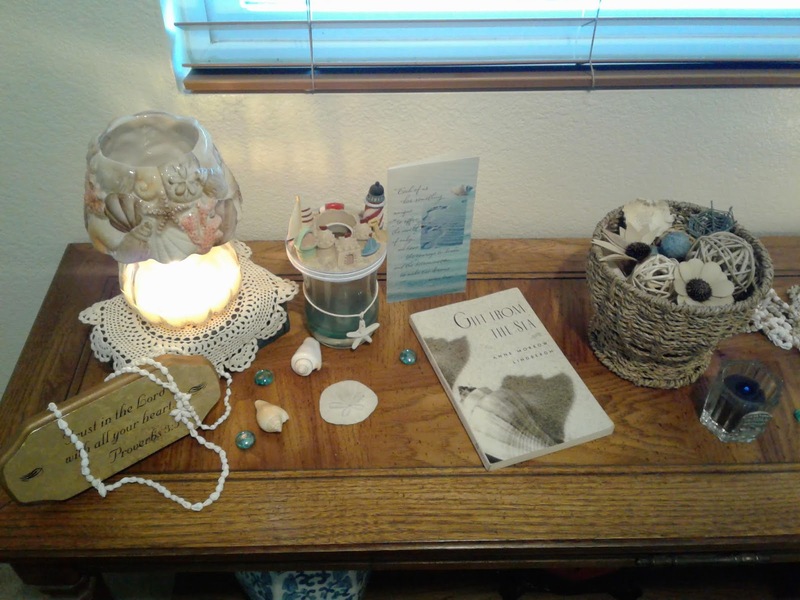 Life-changing perspectives on life as a woman and mother, all written while she was staying in a cottage by the sea in Captiva, Florida. 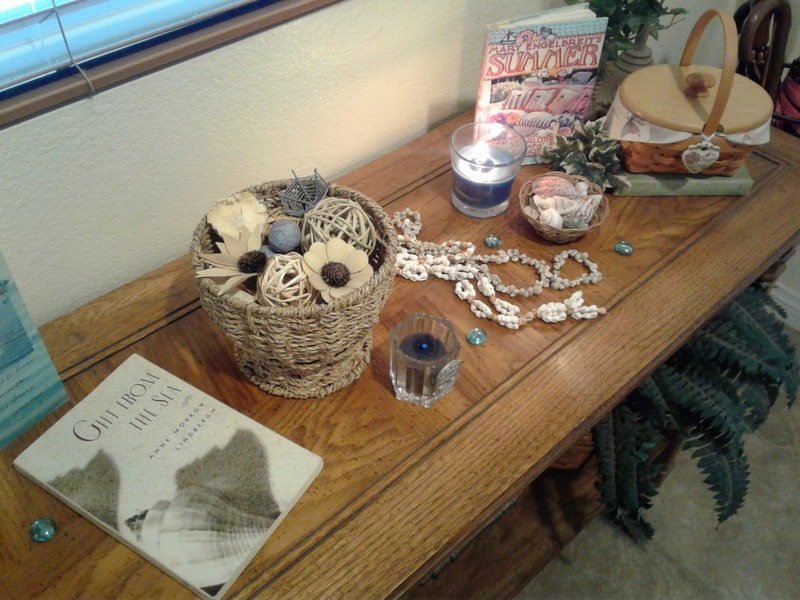 I read this book on the very beaches where she wrote the book years ago, and collected seashells galore from the fertile Gulf of Mexico. This illustration is inspired by that experience - with a bouquet of Plumeria flowers and petite palm fronds, nestled in an ink-bottle vase. Seashells of every stripe surround the scene, where someone has been writing a postcard, or maybe starting to write the follow-up volume to Gifts from the Sea. Whatever it is, I recommend all to Seas the Day. " I second Marcy's advice on reading Ms. Lindbergh's book. I have a copy that I cherish. I display every year at this time. The shells are from visits to the beach, Hawaii and a casino in Las Vegas! 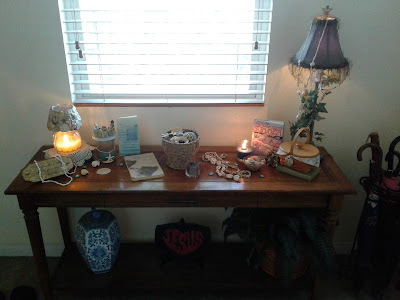 I wish you could smell the fragrances that I have in this area; my candles are gardenia, pool towel, seaside and sand. It smells like summer. Sooo that's probably more than you came for, huh? Haha! 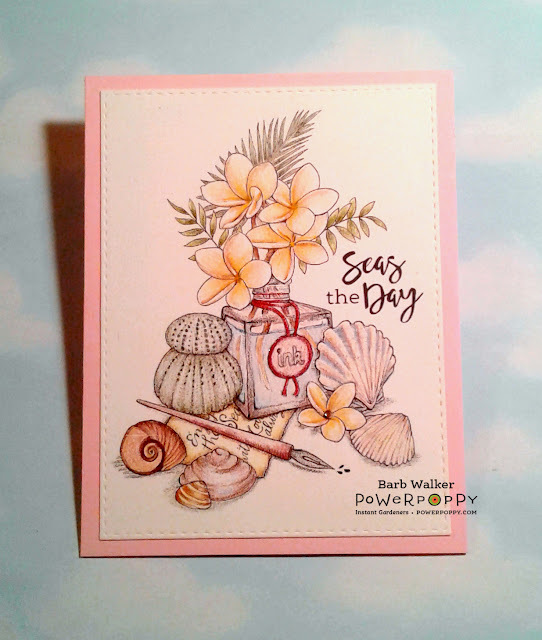 Okay...here's my card share featuring Gifts From the Sea. I wanted clean and simple today. And I wanted soft and soothing. I believe I achieved that. I did some no-stress coloring using my Caran D'Ache Luminance pencils on a piece of warm white Stonehenge paper. I tell ya, that's a match made in coloring heaven. The tooth on that paper is amazing. It just grabs the pigment from the pencils. Coloring is almost effortless. The pencils simply gliiiiide across the paper with very little pressure. That's a very good thing for a person who has carpal tunnel syndrome in both wrists. That's it for me today. Thank you for stopping by. I appreciate the visit. 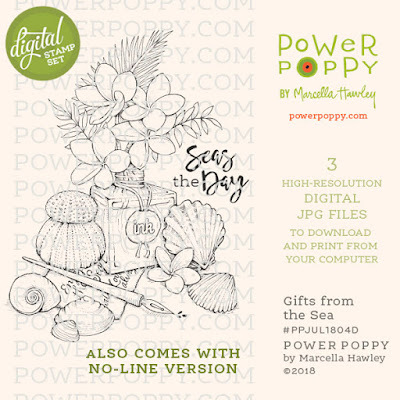 Please buzz on over to the Power Poppy blog to see what my team mates have created to share with you. You know, I remember my mom had the book Gift from the Sea (and unfortunately, I didn't keep it after she passed) but some years ago I picked up a copy to read. I never did, for whatever reason. I just pulled it off my shelf. The image is beautiful. Your coloring on the image is really lovely. The colors are so soft and elegant. You do so well for having carpal tunnel in both wrists. Not fun at all! I just adore your vignette table! What a lovely scene to see every day. How fun that you change it for the seasons. I'll bet it smells heavenly. Thank you so much for sharing this little bit of heaven on earth. Have a happy day! Hugs! Oh My! Your table display is so sweet and summery! But your CARD is STUNNING!! I LOVE the warm colors and you've got me searching for the pencils and paper that you used! I know I can't color as well as you do - but golly, I'm willing to try, try, try if I could ever make a card as beautiful as this one! Thanks as always for the inspiration! Very Pretty in pink! Love it. thank you for sharing! Your arrangements at the door are so lovely Barb! And the card is so soft and soothing. Such beautiful soft pencil strokes!